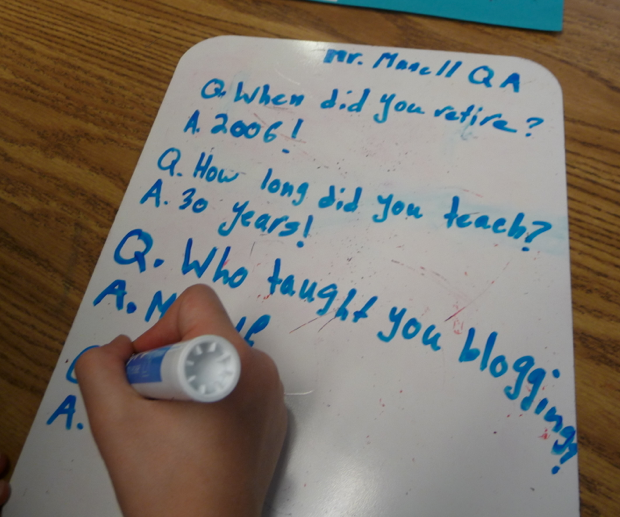 Mrs. Yollis' Classroom Blog: Meet Mr. Mannell! 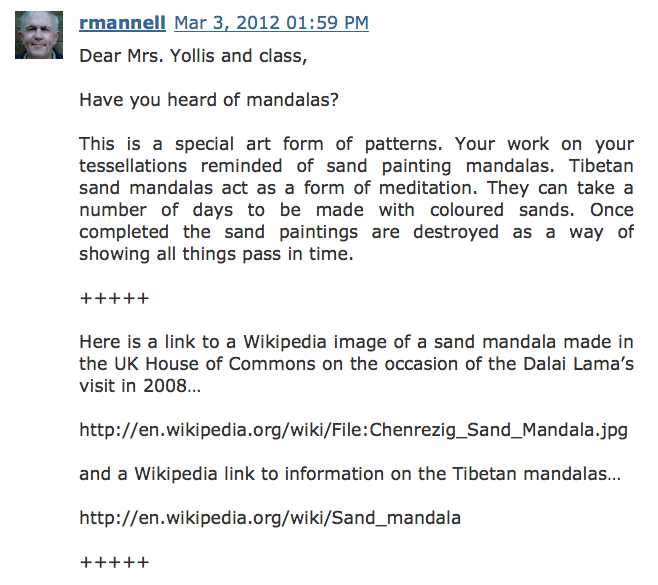 Mr. Mannell, a retired teacher from New South Wales, Australia is a wonderfully supportive member of our online learning community. 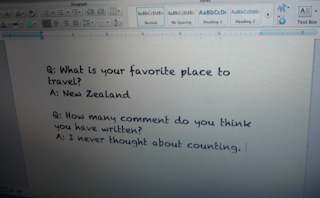 He regularly comments on our classroom blog, and we love learning with him! Here is just one of the numerous comments we've received. This one was from our Tremendous Two Week Tessellation. He always add new information to our posts, and we appreciate his contributions. Mrs. Yollis contacted Mr. Mannell so we could personally thank him for helping us learn. We discovered that we were the first class Mr. Mannell has ever Skyped with! Exciting! The rest of this post was written by: Alexandra, Trey, Brenden, and Alyssa. Here is Sarah's first photo of the Skype call. 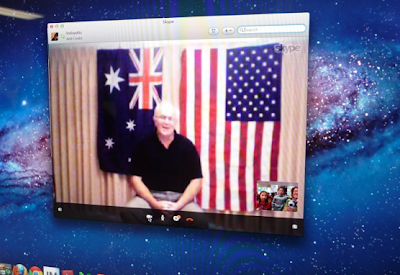 Notice that Mr. Mannell has both flags, the Australian and the American flag. 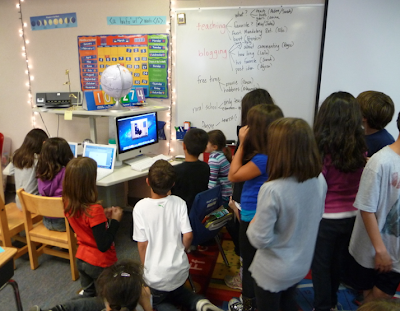 It was exciting to learn that this was Mr. Mannell's first Skype call. Students were listening carefully to Mr. Mannell. We learned many facts about him. 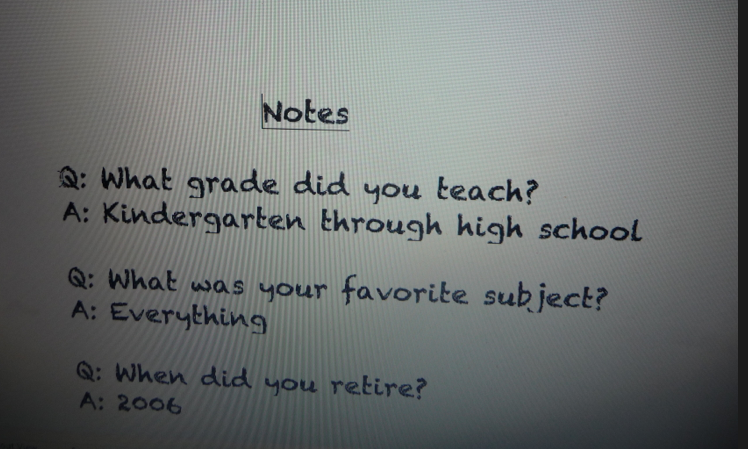 For example, we learned that in his teaching career he taught kindergarten through high school. We were surprised about the range that he taught. Mrs. Yollis has only taught elementary school. Many students were asking questions about the rural school he used to teach at. One questions was, "What was the most uncommon animal that you had to chase off the school yard?" He said that the black snake was the most uncommon. Another question was, "What was the most common animal you had to chase?" He said that the Emu was the most common. Acacia and Leila took notes in Word and Mrs. Yollis placed them in Google Docs. Here is a link. Some students took notes on their white boards. The geographers, Alyssa and Brenden, found New South Wales in our big blue atlas. 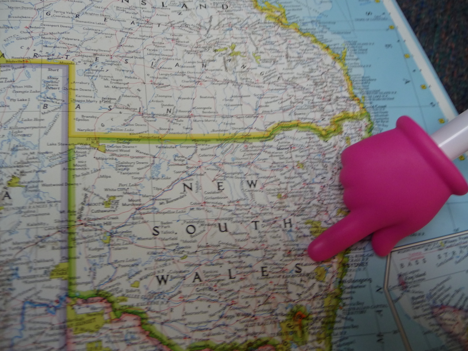 Mr. Mannell lives in the southern part of New South Wales, Australia. One of the things he likes about blogging is that he gets to be part of a class again. As you can see, he is definitely part of our class! 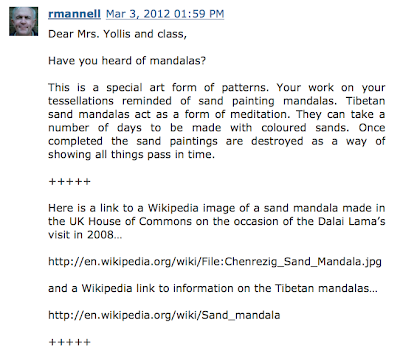 Mr. Mannell often adds to our learning through his blog called Extended Comments. You can leave him a comment without needing an email or joining anything! Check it out! Thanks Sarah for the great photographs! Have you ever Skyped with anyone? Do you have any other questions for Mr. Mannell? Has Mr. Mannell ever taught you anything? How nice that Mr Mannell got to share a new experience with you! 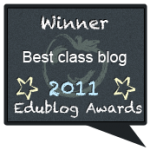 Mr Mannell has left lovely comments on B4's blog too. We were very pleased to find out that Mr Mannell is familiar with our town as he has been here during his travels to New Zealand. 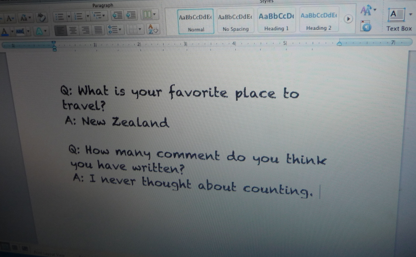 Now, thanks to your Skype post, we have learned that New Zealand is Mr Mannell favourite place to travel to! 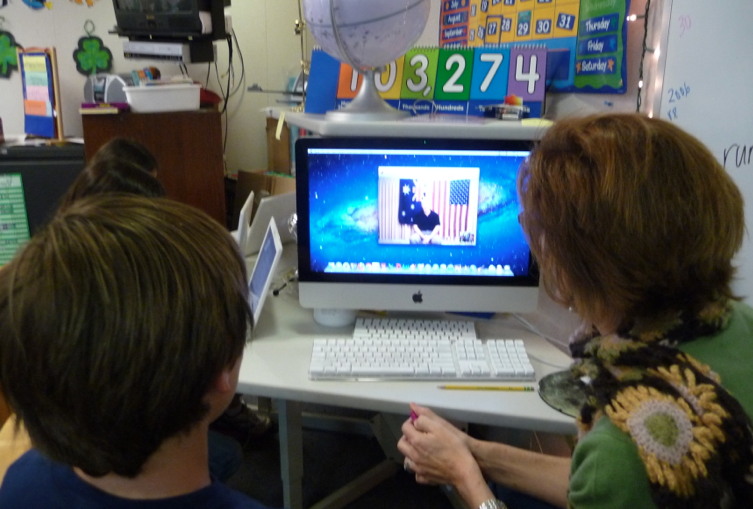 Maybe B4 could Skype with you next term. We have a two week term break over Easter and will be back at school on 23 April. New Zealand has been a favourite place for me since I was 20 and made my first overseas trip. At that time I spent 5 weeks in New Zealand on a very limited budget as I was still a student at university but what an experience. I have covered very many parts of New Zealand from Invercargill in the south to the Bay of Islands in the north. It's a wonderful place to see and a treasure trove of scenery for the photographer. This is just awesome that you were able to skype with Mr Mannell and to think it was his very first time too. I couldn't think of better class to skype with. 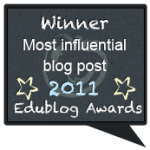 How true Mr Mannell is a wonderful blogger and teacher all wrapped up in one. I, would like to ask Mr Mannell what level of teaching was his favourite? 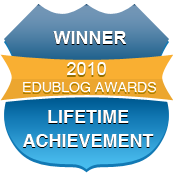 Keep blogging Mr Mannell for we need people like you to ensure that we never stop learning. What a great idea, Mrs. Yollis. Mr. Mannell is a great supporter of student blogging and has been amazing with his support. What a great way to connect your students with him. Our session was wonderful. I had fun in my first Skype session. It was exciting to see and hear you all. It's been some time since I've been able to speak in front of a class like that. 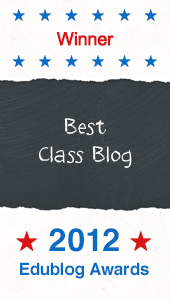 I was delighted to see Mr Mannell featured on your class blog, as he is indeed a valued member of our blogging community and over the past year that Class 2 has now been blogging, we have come to enjoy Mr Mannell's comments greatly - and look forward to hearing what he has to say about our work. He makes a wonderful audience, always constructive in his comments and usually throwing in something new to think about as well. We especially enjoyed the time that he told us all about his farm, we still go back and look at those pictures! Perhaps he should consider a world tour of classrooms he blogs with as his fame spreads! When agreeing to a Skype session with Mrs. Yollis and class, I knew I was in for an adventure. It was my first experience using Skype. As the number of longer comments I make has grown (I can talk too much in real life as well), I started using blog posts as comments, as in the farm photos. Making a post as a comment allows me to add more information, videos and photos without cluttering someone else's blog. A world tour? 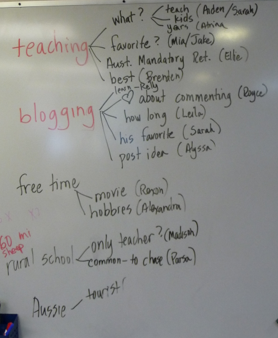 If I had the money, it would be wonderful to visit some of the amazing classes I have come to know through blogging. They show me students all over the world are creative and have wonderful skills and knowledge. Of course, there is a little mystery in appearing as some words on a blog. "I've been typing on my laptop but seem to be having a problem with my connection. I might be about to lose you. I'll just knock on a door to see if someone in this building might be able to help me." I had so much fun meeting Mr. Mannell. I always wanted to meet him because he comments a lot. It was shocking to know that this is his first year commenting. In my opinion he is a great blogger. Yes, I have Skyped with my grandmother. She lives in Iran. That was my first Skype call at home. 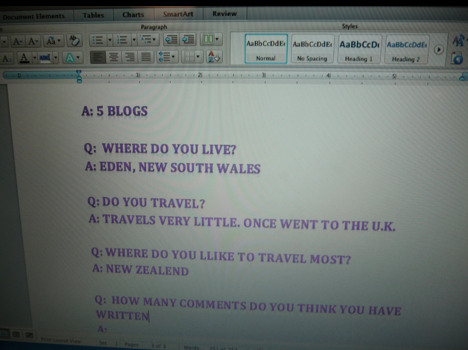 It was about this time last year I had a look at a blog creator site and joined. It wasn't until possibly late May or early June I created my first blog. At the same time I joined Twitter and saw teachers writing about blogs. 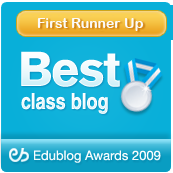 I can't remember the first class blog I visited but I was hooked straight away. There were some wonderful posts from students in the UK. I left comments and was surprised to get replies. Their responses showed me how important it was to leave positive comments. The class was thrilled someone on the other side of the world had taken the time to comment. More contacts and I soon saw a request for information on volcanoes from Class 6D of High Lawn school in the UK. I started to create posts on volcanoes and sent them some samples from my collection (geology and volcanoes are interests). 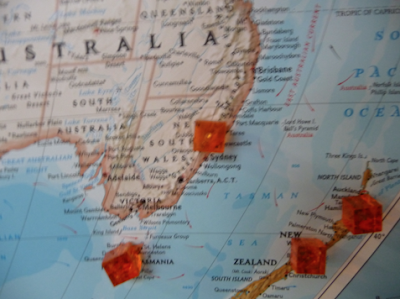 They were able to study samples from New Zealand, Hawaii and Fiji. Now, as the first birthday of my blogging approaches, it's hard to believe so much has happened in such a short time. I wonder what the second year will bring? 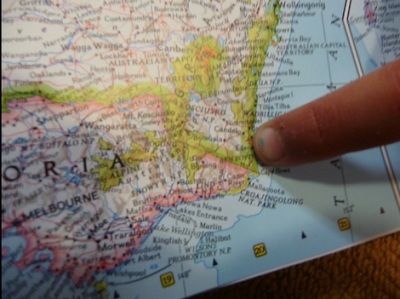 By the way, Atrina, when I lived in Sydney about twelve years ago, I had friends originally from Iran. The Farsi language is very interesting. While it has similarities to Arabic, it is a unique and beautiful language. I also loved meeting Mr. Mannell! I can't believe it's fall there, and we are in the wettest season, spring. The Skype call worked great! I was shocked to learn that he has five blogs! That is a lot of blogs. 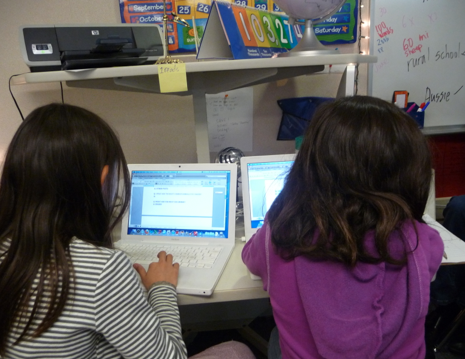 Mr. Mannell is a great blogger! Maybe we could Skype with him again some time. I have skyped with my grandpa and grandma on Long Island, New York. One of the times, my cousins were involved. As you know, I have also skyped with Jarrod. Yes, our world is amazing! You know so much about everything! How did you learn it all? We loved your post, and it is a really good idea to make a blog with extended comments when you want to add pictures. Royce has a blog, but he has never thought of making longer comments in it. Really though, I have always been interested in so many things around us. When people write posts or speak to me, I sometimes recall a little bit of information I once heard or read. Before long I’ve searched the internet or some books to find out a little more. I then often end up writing posts to share what I’ve found and what I remember. Thank you for leaving us a lot of comments! We made a acrostic poem just for you. An acrostic poem is a vertical letter in a name or thing. We hope you liked our acrostic poem! Here is a short one using your names.